What could be better than a chocolate cake for dessert? How about a chocolate cake that is served warm with a river of chocolate running from it? 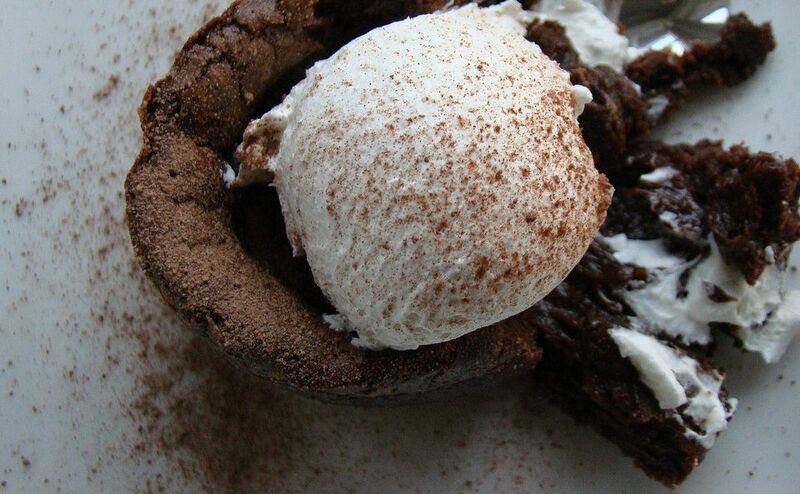 Using dark chocolate makes this recipe for Molten Lava Cakes better than any you can get in a restaurant. Lightly grease four 4-ounce custard cups. In a double boiler, melt chocolate and butter. Stir in sugar. In a small bowl, lightly beat eggs. Add some chocolate mixture to eggs to temper eggs. Carefully, stir egg mixture into chocolate mixture. Add flour and combine completely. Add batter to custard cups. Place on baking sheet and bake for 10 minutes. Centers should be soft but sides should be done. Invert cups on individual serving plates. Remove Cups after 2 minutes. Serve warm with whipped or ice cream.